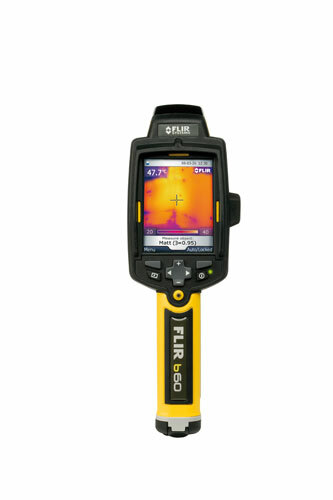 The FLIR B60 Infrared Camera features scalable picture-in-picture (PIP) that allows you to overlay the infrared image directly onto the corresponding visual image so you can see an infrared image super-imposed in a visible light image. Features such as Meterlink™ which allows you to take readings with external devices such as moisture and clamp meters and add the results directly onto the saved image and the voice annotations function which again let you record your voice notes against the image save you both valuable time and also greatly reduce the errors that can be made when writing these down in the field and then having to relate them back to your image when you are back in the office. Wirelessly transmit data from a moisture meter or clampmeter to the Flir b60 via bluetooth. The measurements are displayed on the screen and then captured when you save the image. Record your voice comments to the image via the bluetooth headset (supplied) This feature greatly reduces the amount of hand written notes that you make in the field and allows you to review them later in the comfort of your own office. A conveniently located button activates the laser locator that will help you associate the hot or cold spot in the IR image with the real physical target in the field. On the Flir b60 the laser market is also display on the IR image itself for accurate positioning. 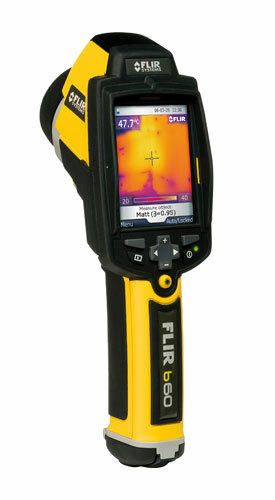 The FLIR b60 has a visual camera with 2.3 Mp resolution. FLIR B60 weighs only 600g and is easy to store in a belt pouch. Clearly see temperature readings on the Flir b60's large LCD display. Laser alignment Position is automatically displayed on the IR image.